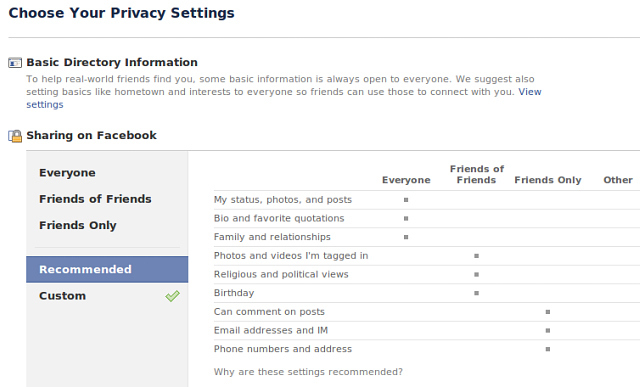 Watch for the new Facebook Privacy Settings - they're coming soon. We've been talking about the uproar over the users' privacy concerns about Facebook's new "open graph." Facebook is now rolling out what they believe is a solution to the problem: a new, simpler privacy settings page. One simple control for changing content viewing permissions to friends-only, friends-of-friends, or everyone — it applies to everything you’ve published on Facebook in the past. This setting will also apply to everything you publish in the future. A simple way for determining how people can find you on Facebook, and what users that aren’t your friend can see. A simple way for turning off the Facebook Platform, specifically, being able to opt-out of Facebook’s new instant personalization features and providing third-party sites with information. Also see: How Facebook's New Privacy Controls Work, on Mashable.